Designing the first advanced fire investigators course that taught his colleagues how to investigate serious wildfires, making Ontario conservation officers leaders in this area at home and abroad. Writing training manuals that explain advanced investigative techniques, wildfire investigations and defensive tactics, including firearm use. Developing training techniques that help keep conservation officers safe in the field by researching different types of martial arts. Emms started his career in northwestern Ontario, where he was recognized as a talented and skilful investigator who welcomed the challenges of gathering intelligence, planning takedowns, apprehending violators and assisting in prosecutions. 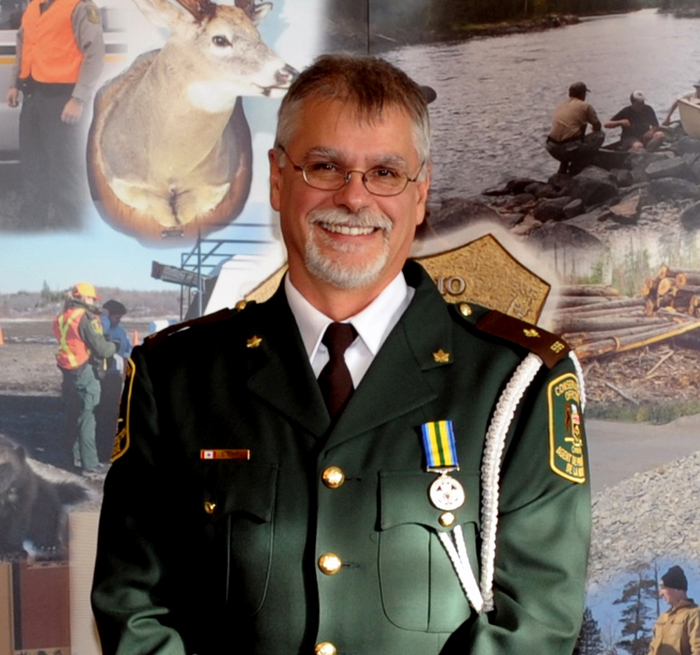 He also serves the Ontario Conservation Officers Association as a regional representative. Emms was awarded the peace officer exemplary service medal in 2009 for 20 years of service. Conservation officers are professional law enforcement officers trained to police standards. Their job is to preserve and protect the province's natural resources. Find out more about the role of an Ontario Conservation Officer. This document was published on August 08, 2014 and is provided for archival and research purposes. Stephen Emms is the 2014 Conservation Officer of the Year.